here in the Southern Highlands of NSW in July this year. The entire month, which is the middle of our Winter here in Australia, especially here in the Highlands where it is one of the coldest areas, we will be celebrating "Christmas" again! But, without Santa!! What's this..... why? you may be asking. northern countries when Christmas falls in Winter. We however, in Australia celebrate Christmas in middle of Summer, so it's hard to cook hot meals and traditional fare on a hot summers day. over 30 years. This hotel is right next door to the farm of "Babe" the famous little talking pig! There will be fabulous dining, high teas, beautiful cakes, patisserie and a brand new "old fashioned' lolly shop. There will be a Christmas Ball, entertainment and more. Christmas lights every night in the beautiful old garden at Fountaindale and decorations, decorations and decorations. Oh, my I can't wait to show you what I am doing for each room. I have so much to do!! There will be a vintage toy exhibition, (I'm on the hunt for beautiful old toys) and a room full of miniature trains.... and then there's shopping, lots of lovely shopping!! When I first started designing the layout and the style of the event, I thought, where are we going to put all the shops, it's too cold outside and (hopefully) it could snow. The first and second floor of this historic hotel are where the bedrooms and suites are. So I decided that we would remove all the bedroom furniture and turn the first floor into a wonderful floor of shopping. views looking out across the countryside. Fountaindale was built in the 1920's so the rooms have lovely old high ceilings and lots character and charm. This room here with all the vintage clothes looks out over the front garden at Fountaindale. The windows are big and the rooms are very warm and cosy. Each shop owner can have their own space to style and present as they please and lock up at the end of each day. We plan to have the most gorgeous beauty area as well on the first floor and as everyone loves to be pampered, we know it will be a busy spot! 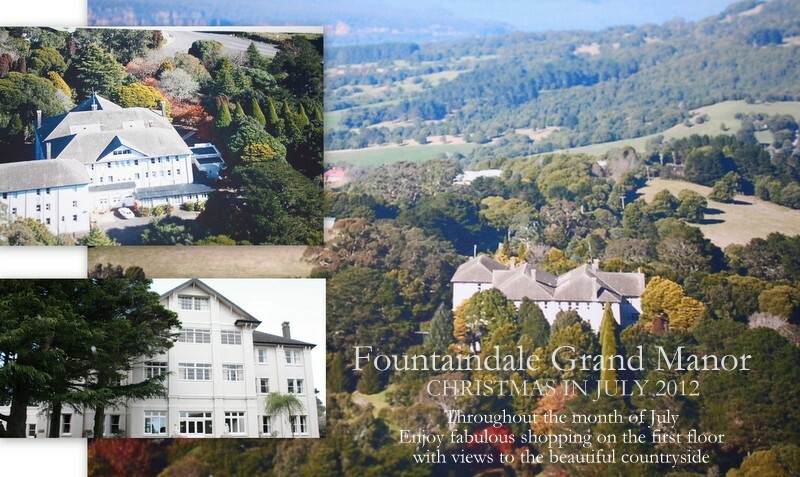 It is to be the first time that Fountaindale Grand Manor has ever offered this, it's unique and it will be such a lovely experience for all to just go up the grand old carved staircase to the first floor to wander from shop to shop. I also hope to have local artists work on display and cabinets filled with treasures. We are now finalising all the 1st floor shopping rooms, so if you're interested to be a part of this four event in the country, please do contact me.. You're all invited to come along, I know many of you are overseas, but, what the heck, why not book a holiday to Australia and spend a little time with us. We have had such a wonderful response from everyone so far and only yesterday I heard that hundreds more have booked their tables for their Christmas in July lunches. I will be sharing more on this event with you as I create it over the next five months. Sounds like a fabulous event. Unfortunately I'll be out of Australia in July............ painting our house in France. Perhaps next year?